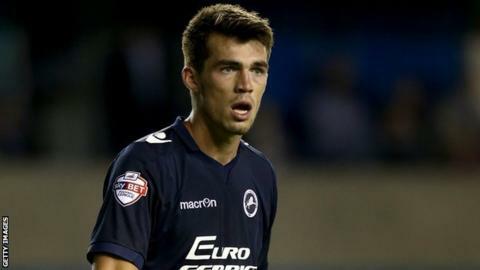 Cheltenham Town have announced the signing of Millwall striker John Marquis on an initial one-month loan. The 22-year-old is a product of the Lions' youth system and had loan spells with both Northampton Town and Torquay United last season. Robins boss Mark Yates told the club website: "John is one we have had an eye on for a while. He has real talent and experience in the Football League. "He is a talented player and I believe he will compliment what we have here." Former Portsmouth loanee Marquis has scored 13 goals in 77 career appearances to date. Marquis played 90 minutes for Millwall in Tuesday's 2-0 League Cup defeat by Premier League Southampton. "We need competition in those forward positions and John will be able to provide that," added Yates. Meanwhile, Cheltenham have also revealed that goalkeeper Matthew Gould, grandson of former Wales and Cheltenham manager Bobby Gould and son of former Scotland international Jonathan Gould, is currently on trial with the club.